If you're like me, what you dream up as summer approaches can only be ready for the fall, at best. Budgeting, planning, studying... I don't "whip" anything up anymore. Friends, making things with leather has always intrigued (and scared) me, and earlier posts of this Shop the Garment District blog has mentioned a few great sources for leather, skins, and related trims... but unless you are particularly inspired, I don't think you're just gonna start cutting into a $60 skin to "see what happens". Especially when you consider that a trip to Leather, Suede, Skins (one of my very favorites) involves an elevator, ringing a buzzer, maybe a bit of scrutiny before they even decide whether to let you in! Who wants to endure that, only to ruin what you purchase there? Hmmm... Maybe I have a bit of a complex about these things? "But... There's so much I don't know...What tools do I need? I can't iron skins... how do I manage the seams? What type of needle do I use? How do I stabilize? Leather isn't forgiving... so what if I make a stitching mistake?" So I have curated this post, deferring to the best examples and advice I can find for the leather enthusiast. Come along! Now... let's say you take a gander at (or study!) this book... I have a copy, and I just adore it. Or Claire Shaeffer's Fabric Sewing Guide (yes, I am recommending it again... 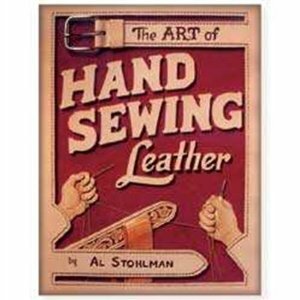 I just can't say enough about the quality of this book), which gives 30 pages of information, tools, and techniques for sewing with leather, suede, faux leather and fur. Or read this post for some great tips..
Or this page of the same website for additional inspiration... but, inly if you really love over-the-top stylish, animal printed things... and who doesn't? Or this page of the same site...which is responsible for my leather hoodie lust at the moment. You might just get inspired! Teachers... OR... There is ALWAYS SO much to learn... part 3 of... ? One of the great joys of learning a craft like sewing and design, is that every time you learn something new, your eyes are opened to an entirely new level of what more there is to learn. It seems that garment-making can be an everlasting pursuit, and, for those of us who love the challenge, that is terribly exciting. In New York City, we have the amazing benefit of being around such incredible talent and knowledge. While we want to absorb it all, it can be hard to find the right classes, books, and teachers. I can only scratch the surface here, but I will share what I have found below. We are as individual as snowflakes, and each of us gravitates toward a different kind of learning experience and environment. Hopefully, if you are looking, you will find your match here... In an earlier post, I described a few programs offered by the big name schools in this city, and the most well-marketed programs I know of. These are the easiest to find, and likely the first thing a web search would reveal. After writing this post, I received a very helpful comment from Ashlee, who teaches at The Sewing Studio. As an instructor at The Sewing Studio I can assure you we do offer an awesome array of beginning and advanced sewing classes. Our full class listing and all registration is done on our website, www.lovesewingnewyork.com. There are specific office hours for admin staff to answer calls since we are a small studio, so our website is the most comprehensive source of info and through email is the best way to receive a quick reply to any questions. This very talented corset-maker and clothier in Manhattan is currently transitioning from private teaching to teaching groups of students in a space yet to be determined. In the meantime, she is taking inquiries to keep potential students informed as she establishes her schedule and location(s). Sharon has more than a decade of professional sewing experience both in teaching/ tutoring sewing to private students, and sewing for private clients. You can find out more about her on her website www.Tailorchickproductions.com, and/or you can follow her blog atwww.tailorchickandthesewingmachine.blogspot.com. If it fits in your budget and lifestyle, you can hop on a plane, and take a class with Susan Khalje. You can go with her to Paris in November, or remain stateside, and attend any of her other teaching events. Explore her whole site... there's a lot more. Clearing my throat... Following my mother's advice on "If you don't have anything nice to say..." I try to avoid reviewing stores whose business practices are questionable. Not wanting to specifically steer anyone away from stores who are clearly struggling to make a buck in this economy, I try to keep those thoughts to myself. I find myself torn as I write this post, because, located just across the street from one another in the garment district, are two stores with WONDERFUL fabric surprises inside... but I'll give you all of the details I feel need to be shared before suggesting you go there. I'll preface my statement by telling you what I am particularly drawn to right now, and why this matters to me. Then, I will tell you why you might love to go to these places, and what to "watch out" for, so you can make your own, informed decision. (Pulling out soapbox and grabbing megaphone...) Living in New York City, I have the incredible luck to be exposed to people of many different nationalities. One of the enormous benefits that comes with living here, is that I am constantly surrounded by a wonderful, swirling, eclectic fashion show on endless parade right in my own neighborhood. The incredible hand embroideries on the clothing from Africa, India, and other exotic points can be simply magical. One thing that has struck me recently, are the textures, colors, and finishes on many of the African fabrics. Specifically, how beautiful they look when sewn up as men's shirts. And, oh... the sari fabrics are gorgeous. The metallic shimmer, the large-scale, boldly confident embroidered motifs... Just to die for. I have lots of Americanized adaptations in mind for such fabrics, and picture incorporating them into my family's wardrobe in the coming months. Having said that, I slither into stores where such fabric is prominently featured, as if lured in by a snake-charmer's flute. Sometimes, the prices for these fabrics are ASTOUNDINGLY low, considering their beauty. And sometimes... "Oooh... so pretty! How much?" "How much you pay?" This exchange can go back and forth for a while, usually culminating in, "Normally, $40 a yard, but for you..." "What fabric is this?" "All silk. 100%. Best quality." Whatever. Guess they didn't consider that an important enough detail to hang a sign over that section of the store. Who cares, right? Well I do. For reasons beyond the obvious desire not to be overcharged, I want to know how to launder, care for, if it will take dye, what to use as lining... basically, what to consider. Now, you can't always be sure what you're getting. I can tell you, however, that the stores I love the most have never steered me wrong. I do think it is important to tell you that it is clear from the purchases dressmaking clients of mine have made, that when they bring me some "special" silk they found, they either heard what they wanted to hear, or were being outright lied to. Luckily for me, one of the stores has already been reviewed by another blogger we all love, so Ill let her make the points I am having a hard time trying to articulate. As for the other store, Yelp does a fine job of telling you what you need to know. I feel kinda dirty, giving you a "You didn't hear it from me..." But hey, you didn't! So here are some ways to know what fabric you're dealing with: Get a swatch for testing. If not possible, start with a smell test. It probably comes as no surprise to you that you can sometimes smell the chemicals in the synthetic fabrics a mile away. So pick it up and smell it. If taking it home, conduct a burn test. I've done this several times to prove to clients that what they bought isn't what they think it is. You can find many burn test guides on the web by Googling "Fabric burn test", but I highly recommend Claire Shaeffer's Fabric Sewing Guide (p. 475) for a complete, thoughtfully arranged chart. This book is absolutely well worth the investment. Claire absolutely knows what she is talking about! If important to you, cut your swatch in half, and test launder with your next load of laundry. (I safety pin a swatch to a garment in the same load, so I can find it later.) Leave the other half of the swatch out as your "control" swatch, and compare it to the one you laundered. That way, you can see what level of shrinkage, pilling and fading to expect. Note: Almost any fabric will last longer and behave better if dry cleaned. So, let's say you've made your purchase, created your masterpiece, and now need to care for your sewn project. Janie Bryant, the costume designer known for her work on "Mad men", has penned a downloadable Fabric Care Guide with the Downy company, giving some good tips to help you consider the care of your garments. A VERY well-respected dry cleaner here in New York City, Madame Paulette, offers what I consider to be the MOST ingenious stain kit ever. Can you believe that there are DRY CLEANING STAIN KITS, which give you the proper solutions for different stain types (protein, earth, oil) in one portable package? I do have some of these myself, and they work! And lastly, but not leastly, you can always put content labels in your garment. Heaven forbid someone else does the laundry or transports your handiwork to a dry cleaner who takes an incorrect guess at fiber content, ruining it completely. Cautionary tale: I was at a designer client's home studio, when a member of her housekeeping staff (yeah, she's pretty wealthy) machine washed a jumpsuit, which needed to be hung to dry. She ended her shift for the day without hanging the jumpsuit, and another staffer arrived and placed it in the dryer. The designer's own handmade design was ruined. No garment care labels were inside. Such a simple addition could have saved the day. Note: Next paragraph is no longer current. I ended the auction described below, because one buyer wanted a significant quantity. Great! Done! I do often put custom care labels on things I create, but if you want to be "official", the best garment labels are sold in bulk. Most of us, not being large scale manufacturers, need manageable quantities, and we want variety, since we sew different fabrics. 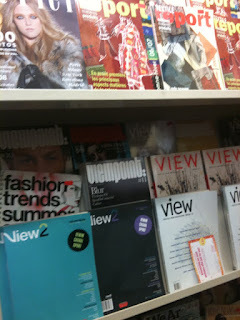 Right now, yes... right NOW... there is a busy group of Pattern Review members scrambling from store to store in the garment district, soaking up every ounce of the creative energy the garment district has to offer. Vendors and appreciators among you, tweet with hashtag #prw2012nyc to show your love! Anyone who creates garments, whether professionally, or even strictly as an enthusiastic hobbyist, gets pretty excited about learning new techniques. Classes can be hard to find, and expensive when you do find them. Books are great, when they are the RIGHT books, and videos can be great... but some of us just need to learn in a classroom setting, with a skilled teacher who uses his/her own HANDS and HEART to teach us. This inspired me to go on a bit of a hunt for learning opportunities. This post could go ON and ON and ON... so if you want more, just ask. I'll list my findings here, and welcome any of you to chime in with your thoughts, experiences, desires, and ideas! When it comes to books, there are so many dedicated to sewing. Some technical manuals are far too technical, and some books written for home sewers are a bit too... well... "homemade" in their approach. 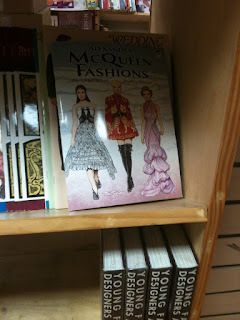 If costume design is your thing, check out The Drama Bookshop on 40th Street near 8th Ave (between NY Elegant and Sposabella Lace). You will be sure to find some inspiration and information there. If you want patternmaking or design books, especially for the aspiring professional who doesn't want to commit to a course of study right now, you may discover some cool books in the bookstore at FIT, which is open to the general public. This Barnes and Noble affiliated store offers a good number of books and supplies, but also reveals a great deal about what ISN'T a priority for the school in these economic times. The book selection is heavy on the glitter and glamour aspects of the fashion business - not too much for the person who actually wants to design or participate manually in the manufacture of clothes. I guess that's just reality, though. If you want to be a factory worker or similar, why bother getting a degree when you can simply bootstrap it, right? And while we're on the subject of bookstores, just WHO is the customer for $50 or $90 fashion magazines? Why do they even exist? Especially when they aren't even sealed in plastic! You can leaf through them right in the store, ya know? Someone explain!?!? Now, across the street (250 West 27th Street - website seems to be down), you will find the Fashion Design Bookstore (open to the public), which has LOTSA stuff, and many interesting things to distract you. 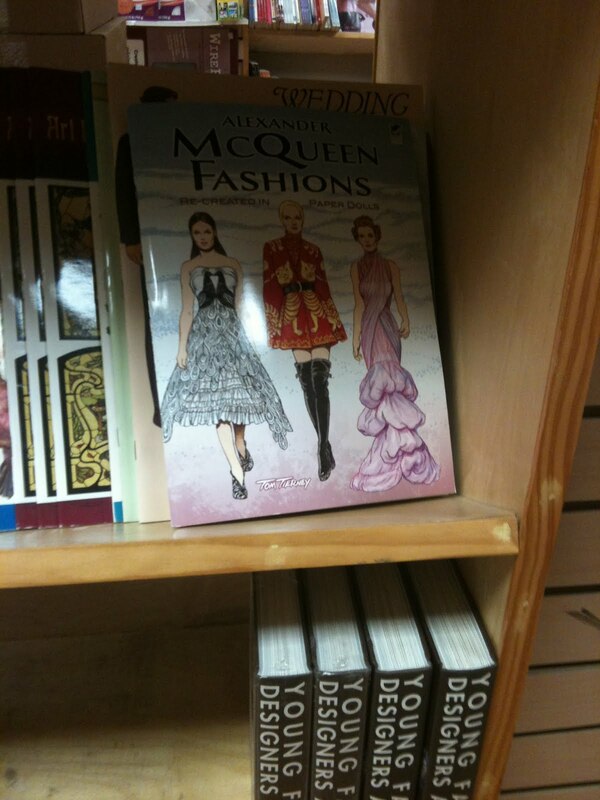 I was looking at design books when... oh wait... Alexander McQueen paper dolls? Really? Oh wait, I digress. 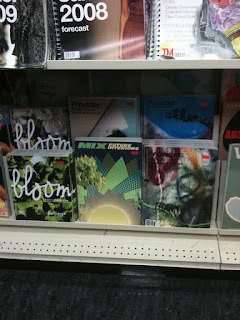 I was looking at fashion books when... oh wait... a T-shirt screen printing kit?.... Oh wait, again, I digress. Not for the ADD creative person... clearly. If you would like to learn draping, in my opinion , there is only one place to REALLY learn, because you really need the right equipment to do it well. Oh, and you should be able to afford the class, too. To learn how to drape, without pursuing a degree, you have to enroll in a Continuing Ed course at FIT. Now, if you have a bit of cash to spend, you can certainly get a good sewing education at Parsons, right in the very heart of the garment district. Click here for continuing education courses Parsons offers. If you want to be a bit less formal about it, and a bit cozier, try The Sewing Studio. In my experience, they hardly ever answer the phone, but the classes must exist, since I know Gertie from the uber-popular Blog for Better Sewing teaches there, and I'd bet you money her classes are a blast! If you are SERIOUSLY interested in an in-depth course of study, learn more about the Maison Sapho School. Not in the garment district, but a VERY serious Manhattan school, where French dressmaking techniques are taught in a no-nonsense course for only the most dedicated dressmaking students. Next, I'll tell you about individual teachers, and why you might want to pursue learning options with them, specifically! To be continued... whew... my hands are tired! The Garment Industry Development Corporation is a non profit organization established in 1984 and is funded by the State of New York. Our mission is to strengthen and support local apparel manufacturing in New York. For the past twenty five years, the Garment Industry Development Corporation has evolved into a -service organization providing sourcing referrals to local apparel contractors, a Designer Development program "Showroom New York" that provides marketing support and a showroom for emerging designers who produce locally and training and technical assistance to New York apparel manufacturers and workers. The Garment Industry Development Corporation is the link between Designers and New York's Apparel Manufacturers. Now, why does that matter? As the owner of a dressmaker referral service, I get a decent stream of calls from designers who want to produce small lots, and would like a single dressmaker's help to make it happen. Now, I completely understand the trepidation one might feel when trying to produce garments for the first time. I often hear that the designer would rather work with one person because it would be "less expensive" than hiring a professional small contractor. While that may be true, I often must ask... and how much less expensive is it when that one person gets sick, burns out, can't finish, or doesn't produce consistent quality when you need it? After all, this is inevitable. You may have a deadline, and a pile of fabric, with no way to meet it. And, truth be told, without the ability to make and deliver the goods on time, you don't/won't have a business. Just food for thought, my friends. Why shop at Rosen & Chadick? In sharp contrast to so many other stores in the garment district, here is a second generation owner-partnership that actually CARES. A great retail shopping experience in a place that mainly serves the trade, they are so knowledgeable and well connected that if they don't have it, they can certainly find out who does, or suggest a great substitute. So, what do they have? What everyone else doesn't. Seriously. If you come out of there unimpressed, tell me. And I won't believe you. Having said that, you can't just walk in, asking "Whatcha got?" and expect to find something fabulous to buy. Their clients have a vast variety of needs. Summon your inner New Yorker and cut to the chase. Wanna see some cashmere? Some washed linen? Soem shirtings? They have them... in colors and patterns TO DIE for. Just don't waste their time. They know a heckofalot about fabric. I remember about a decade ago, when this store was a HUGE ground level establishment, next door to what is now NY Elegant, and the original owners were helping customers personally. I gasped at the beauty... and then the price, on a hanging piece of silk velvet. "Teddy" Chadick, sensing my horror, walked over to me, and, in the most patient, passionate, and kind way, explained to me fully the difference between poly velvet and silk velvet, showing me all of the subtleties that made this fabric "worth" the price. I did return and buy that velvet, making the most painstakingly careful, gorgeous jacket I own. 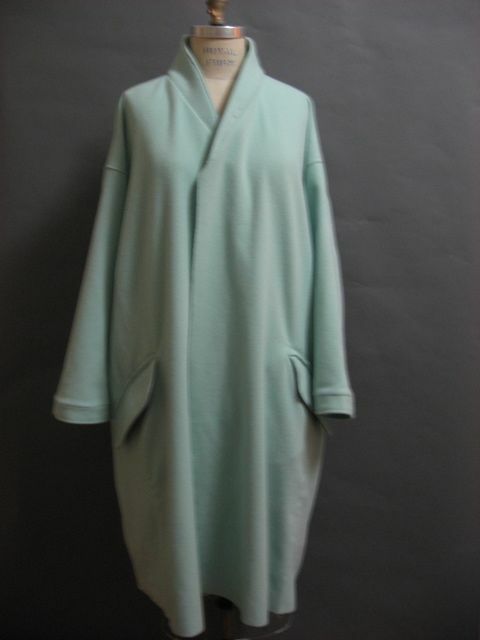 A decade later, it remains in my wardrobe - the color is still as lusciously smoky lavender, the napped texture as softly plush, as delightful to wear as the day I bought it. I can also see and appreciate the differences between fabrics of the same name sold elsewhere, but different qualities. The benefit of shopping there, is that when you need quality, you know you can find it there. The washed linen pants I made in 2006 look as crisp as the day I made them... and that is thanks to great fabric. My wool/cashmere Miyake-inspired coat. The comfiest, coziest fabric around - like wearing a blanket in the winter. Only I know how cozy it is, but, what people say, is "Oh, that COLOR!" Now, THAT"s a reason to shop at Rosen & Chadick. 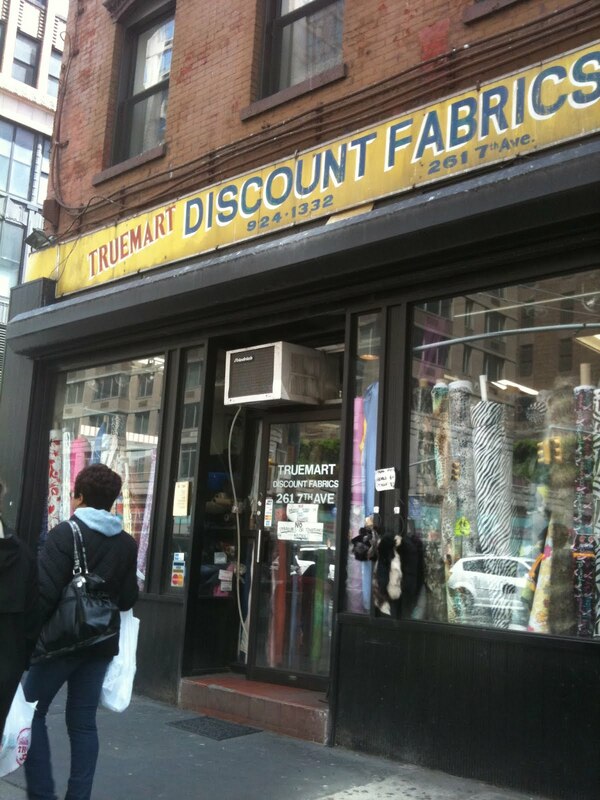 Note: Truemart has undergone what appears to be a wonderful upgrade since that visit, while still a bargain hunter's dream come true! Read about that here.